A defibrillator has been generously donated to the club by one of our members. This is in memory of Ian Schwartz who suddenly collapsed and died following a match in 2003. This web page has been created to help improve the knowledge and use of this device as part of the basic first aid cardiopulmonary resuscitation (CPR ) process. You can learn more about basic life support and CPR at this link. Make sure someone has called for an ambulance. Switch the AED on. Follow the prompts until the ambulance arrives or someone with more experience than you takes over. Take the pads out of the sealed pack. Remove or cut through the casualty's clothing and wipe away any sweat from the chest. Once you’ve done this, the AED will start checking the heart rhythm. Make sure that no one is touching the person. Continue to follow the voice and/or visual prompts that the machine gives you until help arrives. The next section below provides more detail on the use of an AED with supporting video's. 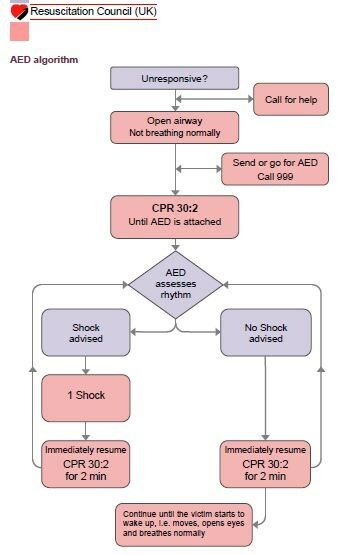 These guidelines are provided by the Resuscitation Council (UK) for the use of automated external defibrillators (AEDs) by laypeople, first responders and healthcare professionals responding with an AED outside hospital. of successful defibrillation decline at a rate of about 10% with each minute of delay, basic life support will help to maintain a shockable rhythm but is not a definitive treatment. AED’s are sophisticated, reliable, safe, computerised devices that deliver electric shocks to victims of cardiac arrest when the ECG rhythm is one that is likely to respond to a shock. Simplicity of operation is a key feature: controls are kept to a minimum, voice and visual prompts guide rescuers. 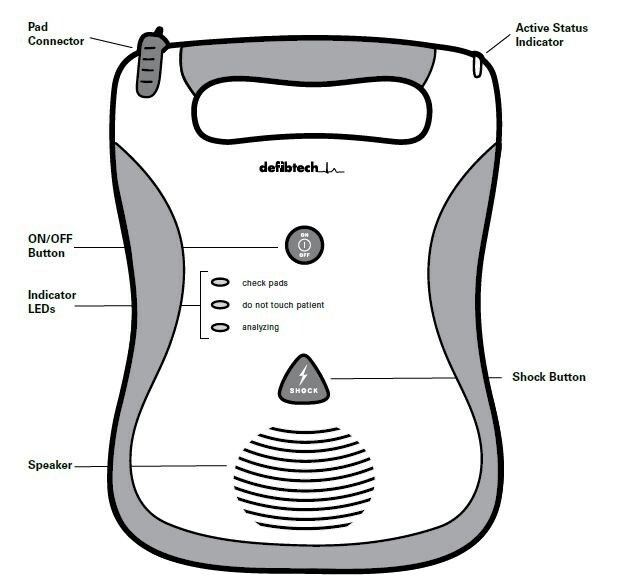 Modern AEDs are suitable for use by both lay rescuers and healthcare professionals. All AEDs analyse the victim’s ECG rhythm and determine the need for a shock. The semi-automatic AED indicates the need for a shock, which is delivered by the operator, while the fully automatic AED administers the shock without the need for intervention by the operator. The club is provided with a semi-automatic AED. An AED can be used safely and effectively without previous training. Therefore, the use of an AED should not be restricted to trained rescuers. However, training should be encouraged to help improve the time to shock delivery and aid correct pad placement. When using an AED, minimise interruptions in chest compression. Do not stop to check the victim or discontinue cardiopulmonary resuscitation (CPR) unless the victim starts to show signs of regaining consciousness, such as coughing, opening his eyes, speaking, or moving purposefully AND starts to breathe normally. The following sequence applies to the use of both semi-automatic and automatic AEDs in a victim who is found to be unconscious and not breathing normally. 1. Follow the adult BLS sequence as described in the basic life support chapter. Do not delay starting CPR unless the AED is available immediately. · If more than one rescuer is present, continue CPR while the AED is switched on. If you are alone, stop CPR and switch on the AED. · Follow the voice / visual prompts. · Attach the electrode pads to the patient’s bare chest. · Ensure that nobody touches the victim while the AED is analysing the rhythm. · Ensure that nobody touches the victim. · Continue as directed by the voice / visual prompts. · Minimise, as far as possible, interruptions in chest compression. · Resume CPR immediately using a ratio of 30 compressions to 2 rescue breaths. · the victim starts to show signs of regaining consciousness, such as coughing, opening his eyes, speaking, or moving purposefully AND starts to breathe normally OR you become exhausted. Place one AED pad to the right of the sternum (breast bone), below the clavicle (collar bone). Place the other pad in the left mid-axillary line, approximately over the position of the V6 ECG electrode. It is important that this pad is placed sufficiently laterally and that it is clear of any breast tissue. Although most AED pads are labelled left and right, or carry a picture of their correct placement, it does not matter if their positions are reversed. It is important to teach that if this happens ‘in error’, the pads should not be removed and replaced because this wastes time and they may not adhere adequately when re-attached. The victim’s chest must be sufficiently exposed to enable correct pad placement. Chest hair will prevent the pads adhering to the skin and will interfere with electrical contact. Shave the chest only if the hair is excessive, and even then spend as little time as possible on this. Do not delay defibrillation if a razor is not immediately available. As long as there is no direct contact between the user and the victim when the shock is delivered, there is no direct pathway that the electricity can take that would cause the user to experience a shock. Dry the victim’s chest so that the adhesive AED pads will stick and take particular care to ensure that no one is touching the victim when a shock is delivered. There are no reports of fires caused by sparking where defibrillation was delivered using adhesive pads. If supplemental oxygen is being delivered by a face mask, remove the face mask and place it at least one metre away before delivering a shock. Do not allow this to delay shock delivery. The importance of early, uninterrupted chest compressions is emphasised throughout these guidelines. Interrupt CPR only when it is necessary to analyse the rhythm and deliver a shock. When two rescuers are present, the rescuer operating the AED applies the electrodes while the other continues CPR. 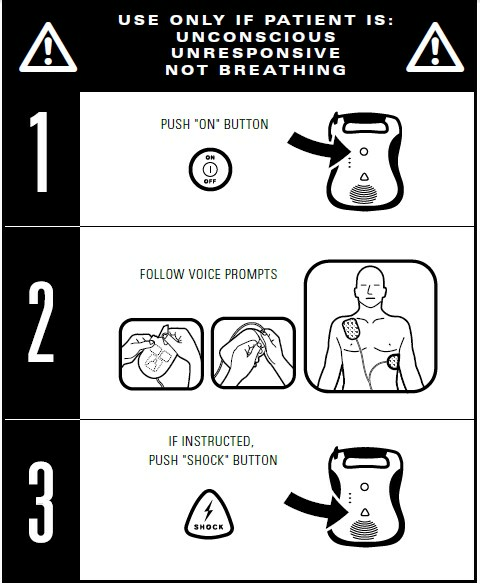 The AED operator delivers a shock as soon as the shock is advised, ensuring that no one is in contact with the victim. Provide good quality CPR while the AED is brought to the scene. Continue CPR whilst the AED is turned on, then follow the voice and visual prompts. Giving a specified period of CPR, as a routine before rhythm analysis and shock delivery, is not recommended. To test your knowledge and experience, download the life saver app for smart phones or tablets.